Yesterday's Trade Deadline saw the Pittsburgh Penguins pick up two depth defensemen in Ben Lovejoy and Ian Cole. Both defensemen were had for Simon Despres and Robert Bortuzzo along with a 2016 seventh-round pick, respectively. Instead of providing statistics and analytic points as to why these two additions will either be good or bad for the Penguins, I'm simply going with observations of the deals. First and foremost, I like the fact that the Penguins upgraded with Ian Cole and Ben Lovejoy. Robert Bortuzzo and Simon Despres were defensive liabilities. As physical as they were and endeared themselves to the Pittsburgh fans with their edgy play, they would often be caught out of position and leave either Marc-Andre Fleury or Thomas Greiss high and dry. Cole and Lovejoy will bring a bit more responsibility on the back end and provide a physical presence as well. Maybe not so much as their predecessors, but will still be difficult to play against. Secondly, I do not like that Despres was the one to go in exchange for Lovejoy. Granted, the paragraph above this would say otherwise, as a fan of Despres ever since he was drafted in 2009, I was finally starting to believe the Penguins trusted him in the line-up. He was leading the team in hits at the time, had solid offensive numbers, and was stellar playing alongside Rob Scuderi. I understand General Manager Jim Rutherford was not going to trade Derrick Pouliot, but I can't help but think Anaheim would have bit with either Brian Dumoulin, or Scott Harrington, or even both. Olli Maatta's season-ending shoulder surgery along with Christian Ehrhoff's recent health issues put Rutherford in a tough spot and after having a day to think about it, I understand why he made the deal and reluctantly accept it. 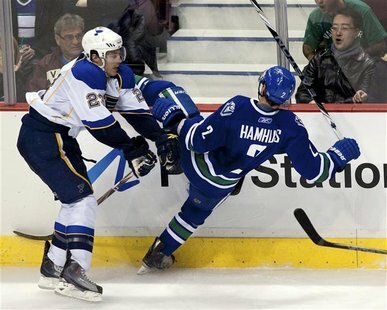 Ian Cole is a former first-round draft pick who has never really flourished in St. Louis. Hopefully a change of scenery will reignite him. The issue with Cole is I don't see him immediately slotting in the top six. As much as I love the play of Derrick Pouliot, I do believe that he would be a liability in the playoffs. Cole has some playoff games under his belt and has been an NHLer longer than Pouliot. I'm not saying that's the only reason he should be in the line up or that that is my best reasoning, but I am saying that Pouliot, I truly believe, will not be ready for that kind of pressure until next season. Cole and Lovejoy bring proven NHL minutes and experience to the team. If the idea were to play Pouliot the whole time, then why trade a depth guy like Bortuzzo anyway? The Cole deal has a lot of "if/and/or" possibilities, but I personally think you play him immediately. Don't get me wrong either, I love Ben Lovejoy. I was sad to see him leave two years ago, but the fact of the matter was he was not going to get the right amount of playing time he deserved. When he was traded to Anaheim, he finally had an opportunity to mature his game and develop into a proven NHLer. I like the addition back, but he is 31. Despres was 23. Future aside, Lovejoy's experience makes sense. Taking the future into account, Despres was finding his game...at 23. It's a coin toss right now, but we will see how these deals pan out. Personally, I love the deals. The Penguins added depth defensemen who are responsible in their own end, can contribute offensively if needed, and bring experience to the Penguins defense. When you pair them with Kris Letang, Paul Martin, Christian Ehrhoff, and Rob Scuderi, the Penguins have a deep defensive core and will be a challenge for any team in the playoffs. Both players will look to prove why they were sought after additions to this team and look to contribute towards a potential Stanley Cup. The Penguins future success will not be based solely off of their play. It is the stars that need to come through and perform, but with Cole and Lovejoy's added depth, I don't have as much concern heading into the playoffs this year as I did a week ago.